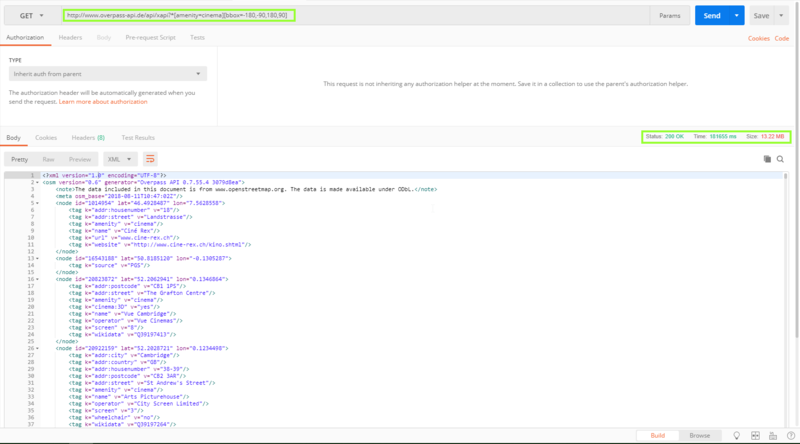 How to query Overpass API with Postman? I would like to know if I can do that with a REST query in Postman. On harrywood.co.uk it seems I can create the query but I must be doing something wrong. Dammit! I feel I'm so close! I can see there are other questions like mine, but they are not about Postman, so I don't really see how can I use those information. 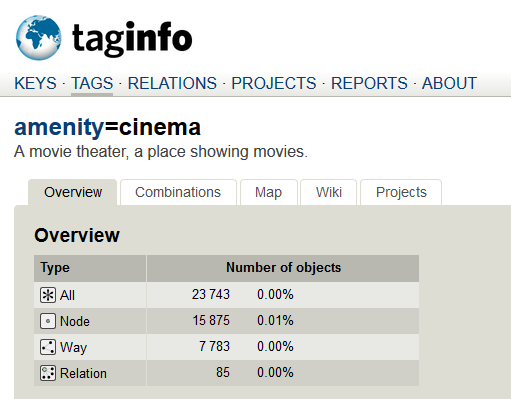 I now know that there are 23.743 cinemas in the worls and if it's possible I would like to retrieve those information. 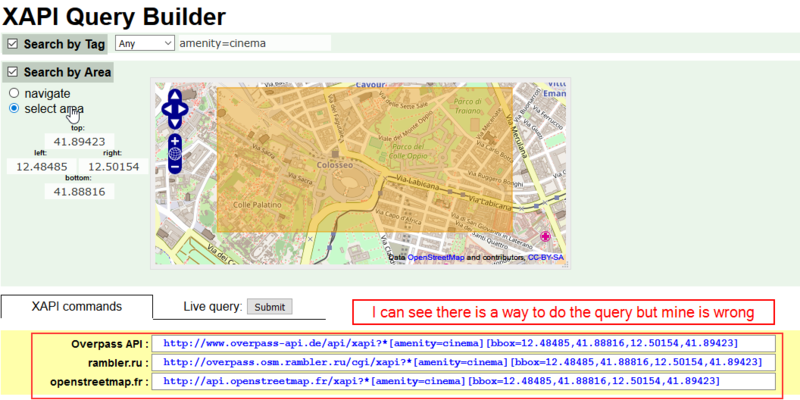 At overpass-turbo.eu build your query, then simply go to Export -> Query -> OverpassQL for obtaining an Overpass API URL for your query. Unfortunately I have absolutely no idea what Postman is. If you want to learn fishing: Go to https://overpass-turbo.eu/ Then enter the overpass query (QL/XML doesn't matter) that you like to check. Before running the query, open your browser network tab from its developers tools and then press run. You'll see how the data is posted. Not the answer you're looking for? 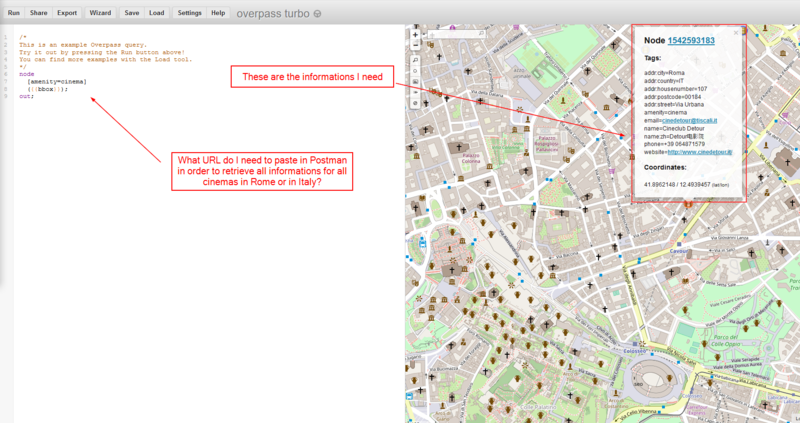 Browse other questions tagged openstreetmap overpass-api rest overpass-turbo or ask your own question. Getting list of all embassies using Overpass API? How to reduce Overpass way QL statement output to just tags? How to programmatically execute an overpass query? How to generate a CSV file from Overpass with ID and tag value?